Now seeking applications for our 2016-2017 Share the Plate Award! We’re moving into a process for selecting Share the Plate recipients that involves the participation of the whole congregation. Organizations can apply directly or be nominated by our members to receive support from us for one year. Any organization that is nominated by a FUUW member must complete the application form with or without the help of the member who nominated them. The deadline to apply/nominate is Dec 31st, so it’s time to act now! 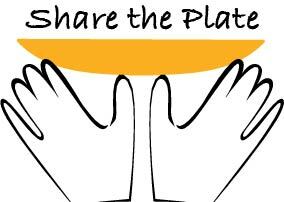 Share the Plate is our commitment of giving monthly financial support to selected organizations in Wichita who do social justice work in our community. Our current recipients are Sunflower Community Action and Faith in Global Action, and they each receive one Sunday’s contributions (per month) given when we pass the plate in service. The next recipients will begin receiving our support for one fiscal year from July 2016 – June 2017. The full application form is now available here and on our FaceBook page. Please email me if you need more info: socialaction@firstuu.net. Organizations wishing to apply must submit a proposal that includes financial information about the organization, as well as a means of measuring success. Recipients must commit to monthly communication with First UU staff and leadership, particularly about ways that First UU members can get involved in the organization’s activities and events. Recipients must be based in Kansas, have a working presence in the Wichita area, and implement projects related to the UUA’s annual Congregational Study/Action Issues. In January, the congregation and leadership will select up to four finalists to be considered for a final vote at the Annual Meeting in May/June. Each finalist will have an opportunity to address the congregation during services between Feb – May so we can all learn more about their work.